Even though my much-hated Russel T. Davies is now long gone and his replacement, Steven Moffat, has produced the best season of Doctor Who in its decades-long run, Davies is still able to perform the unthinkable and tarnish the franchise, retconning one of the most important parts of the Time Lord mythology: the regeneration limit. In an upcoming episode of the aforementioned spin-off The Sarah Jane Adventures written by Tardfest himself, the new Matt Smith Doctor tells another character that there is no regeneration limit - in a throw-away line. Not explained as a main part of the plot, or even in a scene of actual significance - in a throw-away line, quickly forgotten about. It's the kind of thing that'll be the last straw for Doctor Who GINOs, and a move that represents everything that's wrong with Davies as a writer and a human being - but let's go back to the very beginning, where that new (and crappy) companion was attacked by the first race that Davies chose to take a dump on, the Autons. When the Nestene Consciousness, an extraterrestrial, disembodied gestalt intelligence, arrived on Earth in hollow plastic meteorites, they infiltrated the Auto Plastics company and began manufacturing servants. Dubbed the Autons, these life-sized plastic dummies conceal deadly weapons within their hands, which can kill or vaporize their targets. The typical Auton does not look particularly realistic, resembling a mannequin, being robotic in its movements and mute. However, more sophisticated Autons can be created, which look and act human except for a slight plastic sheen to the skin and a flat sounding voice. Davies chose his debut Who episode to rewrite pretty much everything about the Autons while never actually naming them, and as part of the crappy Doctor Who action figure line a suitably crappy action figure has been made of said alien race. 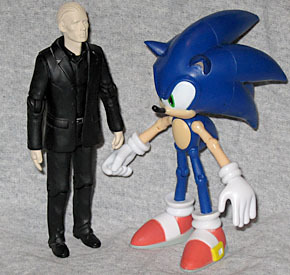 The Auton stands about 5½" tall, a little bit too tall for the rest of the line and completely out of scale with everything else in your collection. He dwarfs 3¾" Star Wars figures and looks miniature compared to everything 6" and above, rendering his scale total crap. He's well-sculpted, accurately portraying the mannequin look, although he's barely detailed - the only place you can see any paint at all is his belt buckle, everything else is simply one of two colours (either black or plastic). The black that is his clothes is particularly susceptible to dust, which seems to cling to it, looking awful. Autons have guns built into their right hands, in which the fingers form one part which flips open to reveal the gun beneath. Now, if the makers of this toy weren't as retarded as Davies, they'd have added a joint below the fingers allowing the hand to flip open to reveal the firearm, identically to the onscreen alien - instead, they have the fingers removeable via a peg inside. It makes no sense and looks terrible. The fingers will also be lost quickly, so keep them on the crappy toy. The Auton is articulated, albeit poorly - he has swivels at the shoulder, neck and wrists - the former which should be balljoints - and is additionally jointed at the knees, elbows and midsection. I want to reiterate that he's crying out for balljoints, which wouldn't look nearly as ugly as all the peg joints on him. Fortunately he's stable and will stay standing, which is better than lots of NECA topplers. This awful action figure is the perfect plastic representation of the crappy Davies years of Doctor Who - thank god they're over and in the past. Let's hope that Steven Moffat has the power to ensure that after this Regeneration Limit retcon garbage he can keep Davies far, far away from the franchise, stopping any future damage he might cause.